Washi stainless steel pair of cutting sheers with a three fingers grip that makes cutting easy on your hands and even more precise. Size is 5.75. This Silver 2X101 3-hole hair scissor gives you total control. The double finger holes allow you correct positioning and alignment of your fingers, a great feature to help prevent carpal tunnel syndrome. The Offset Thumb Handle lowers the elbow and shoulder position. 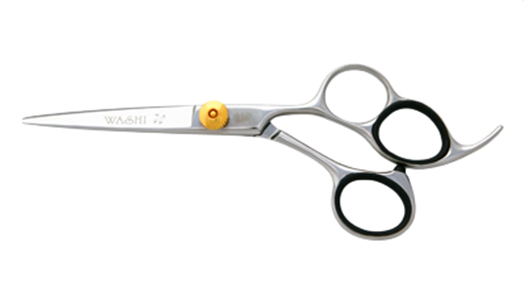 Made from 440 C steel, the silver stainless steel makes this a light weight shear.